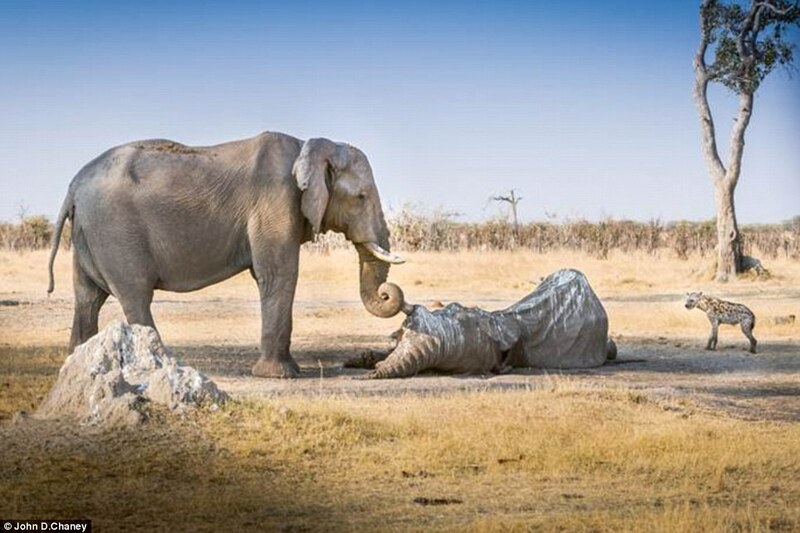 This heart-wrenching image has captured the incredibly rare moment a mourning elephant says goodbye to her fallen friend. John Chaney, 63, was on a safari trip in Botswana with his wife Diane when they came across the carcass of a dead elephant surrounded by vultures and hyenas. As their guide called park rangers to come and remove the tusks so they wouldn't fall into the hands of poachers, another elephant charged over to the body. The female elephant scared off the animals surrounding the carcass before tenderly placing her trunk around the tusk of the dead male. Mr Chaney revealed how the group were then brought to tears as the female elephant stood guard over the body of her friend for several hours in what appeared to be a moving vigil.